Anna's Veranda is a 100-Year-Old Victorian Home on a pristine Dune Preserve. 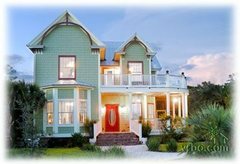 We are located in the Inlet Beach neighborhood of the Florida Panhandle in South Walton County, right next door to Rosemary Beach. The moment you step into the foyer of Anna's Veranda you will feel right at home. The soothing palette of cool greens and blues will enhance your "vacation attitude." Anna's Veranda is the perfect location. With an amazing view of the ocean, gorgeous flowers, and an amazing older house, you truly couldn't ask for a more picturesque place. The beach is semi-private, providing an intimate backdrop. 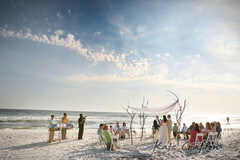 I would recommend Anna's Veranda to any bride looking for the romantic beach wedding of their dreams. 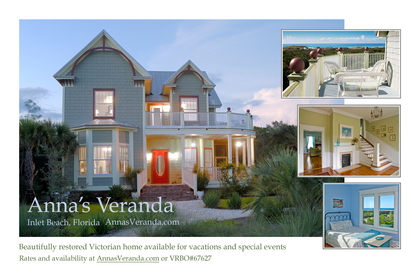 Anna's Veranda is a 100 year old house that was moved from Marianna, FL to Inlet Beach. It has been lived in as a single family residence, later turned into apartments, then turned back into a single family residence, and most recently purchased and remodeled by Anna Hamer and her partners. The house was literally falling apart before the renovation, and it now stands as one of the most beautiful houses I've ever had the privilege of visiting. Anna's Veranda has two wrap-around verandas, a screened porch on the side of the house, and a covered stoop on the back of the house. With a privacy fence and palm trees lining the back of the yard, it's *perfect* for entertaining. As you walk up the brick steps to the front door of the house, you know you are about to enter a special place. The front door opens to a beautiful, open foyer and you immediately notice the antique creak of the heavy door, the hardwood floors, the tall ceilings and door ways, the gorgeous white woodwork, an inviting fireplace, beautiful chandeliers, and a soothing color palette that says "come in, sit down, stay awhile..." The downstairs boasts a formal parlor and a living room with sleeper sofas, a beautiful dining room with a table I quite possibly would have stolen if I had a moving truck, seating for 12 people in the dining room, a kitchen that is fully equipped for any chef or caterer, and a full bathroom. Upstairs, there are four gigantic bedrooms, two full bathrooms, and a half bath. The upstairs could easily sleep up to eleven people (not including the sleeper sofas available downstairs). The rooms are spacious with tons of natural light and gorgeous views. My favorite bedroom is painted turquoise with coordinating accent colors, a beautiful (and COMFY!) king size bed, a gorgeous antique armoire, and a huge attached bathroom that can be closed off for privacy. This was the room where I spent our wedding day getting ready, and I can't think of a place I would have enjoyed any more than this. The 2nd bedroom had two queen size (or maybe double?) beds, an armoire, dresser, and trunk and a charming old rocking chair. The best part... the breathtaking view of the ocean! All of these rooms, especially this one, are much bigger than they look in pictures. The 3rd bedroom held a queen size bed, bay window seat overlooking the ocean, and an exterior door to the upstairs veranda. The 4th bedroom contains a sleeper sofa, bunk bed, and a private bathroom. I *think* this bedroom also has an exterior door to the upstairs veranda but I could be mistaken. The entire house - every little nook & cranny - is full of Anna's personal touches. The paint colors, the brilliant mixture of antique and modern accents, the custom furniture, chandeliers throughout, knick knacks, books, the beautiful bathroom sinks, clawfut tub, fireplace with a mosaic of seashells, adorable lamps, an abundance of blankets, comfy mattresses, and other things to make your stay even more comfortable. Anna didn't forget a single detail... this house has it all. And Anna is such a pleasure to talk to. She was so helpful, answered all of my questions almost immediately from her Blackberry, and took time out of her busy schedule to meet with my vendors. She put a lot of time and love into this house and it shows in every single detail.